J.M. DeMatteis's CREATION POINT: IT'S STAN LEE'S BIRTHDAY! Contemporary comic book readers can’t possibly understand how different the 1960’s Marvel Comics were from everything else on the stands. DC’s comics—for all their imagination and artistic flair—were pristine and sculpted, All-American and squeaky clean to the point of being nearly antiseptic: no rough edges, no raw emotions, nothing messy at all. If you looked at the Marvel books, especially in the early days of the line, it was all mess. The covers said it all: lurid colors. Captions screaming for your attention. Oversized word balloons with thick, black borders around them. Artwork so primitive it was frightening. The Marvel Universe was everything an adolescent boy in love with super-heroes and science-fiction could ever ask for. It exploded my imagination—and I’ve been picking up the pieces ever since. 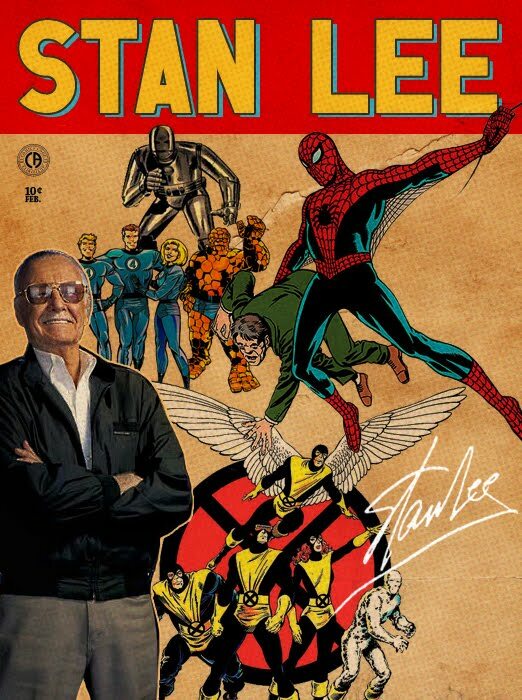 There’s been much debate, down through the decades, about the relative contributions of Stan Lee (who was Marvel’s editor, art director, and head writer in that formative era) and his collaborators. From my perspective, Stan’s contribution was incalculable. Even if, hypothetically, Jack Kirby and Steve Ditko (both of whom were absolutely essential to the company’s success, it couldn’t have happened without them) plotted every single one of those stories on their own, Stan created the vibe and the mythos of Marvel Comics. He did it with cocky cover copy and the warmth of the Bullpen Bulletins pages, the hilarious footnotes and scripts that managed to be absurdly pseudo-Shakespearean and yet utterly down to earth at the same time. Most important were the absolutely relatable (especially to a boy on the verge of adolescence) characters, constructed of equal parts angst and humor and, most important, heart. Stan put his passion into those pages. They clearly mattered to him, and so they mattered to us, as well. If Marvel hadn't cast its magic spell over the comic book industry, changing the creative rules of the game, there's a very good chance I would have left comics behind in junior high school (for the record, the first Marvels that hooked me were F.F. #54 and Spider-Man #40, at the tail end of the seventh grade) and never even considered writing them. And I'm sure there are dozens, if not hundreds, of comic book creators who would say something similar. You simply can't underestimate the impact that Stan had—and still has, all these years later. Happy birthday, Stan! We're blessed to have you! Went to a comic convention a few years back with my father, who told Stan Lee he'd been following him for pretty much his entire life. Without missing a beat, Stan quipped, "You finally caught up with me!" At a Q&A session I attended, a fan asked Stan how he could follow in his footsteps. And Stan replied, "Don't give advice to your competition!" Stan is one of the most charming, witty and engaging individuals you'll ever meet, even if your encounters are measured in seconds. I've only had a few encounters with Stan over the years, David, but, they've certainly been memorable. (Really, if he'd just grunted in my direction, it would have been memorable.) Mr. Lee is a pop culture treasure and I hope he sticks around for many years to come.